A model walks the runway at the ‘No Sesso’ Chapter 2 runway show during New York Fashion Week on February 4, 2019 in New York City. No Sesso co-founders Pierre Davis and Arin Hayes are New York Fashion Week newcomers, but their reputation is already well established among industry cool kids. The Los Angeles-based design duo that also deejays part-time have bridged music and fashion with their gender-defying clothing, as seen on the likes of Lizzo, SZA, Chloe x Halle, and Kelela. No Sesso is an artisanal brand that is fun and whimsical, but also celebrates art and technicality – all under the umbrella of the brand’s overall curation and creative direction ... But beyond the fashion, the brand is also about community and uplifting marginal groups and each other. No Sesso is very much an LA brand. The brand really took off here and allowed us to cultivate the more complete experience for the brand we always envisioned. We’re also more laid back in our demeanor, even though we take things very seriously. But we’re super-fun and easy to be around. We have a running joke about what we call our LA sweaters, which are always super cropped and usually sheer or loosely knit. 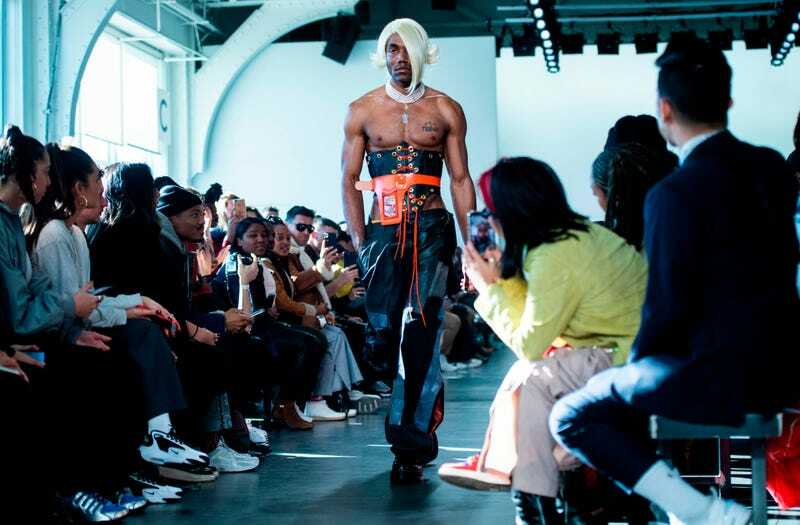 No Sesso has developed a cult following by challenging convention in the fashion world, while at the same time appealing to underrepresented and underserved communities, and championing inclusivity through genderless fashion. The unisex fashion movement has been abuzz in the industry for a couple of years, so it’s about time the 1.4 million adults (as of 2017), who don’t identify with a specific gender start to get the recognition and options they crave. The Glow Up witnessed #NoSessoOrDie’s New York Fashion Week debut in person, and it was magnificent. Fashion elite packed Pier59 Studios one afternoon during NYFW’s kickoff to view a unique showing of shapes and textures draped on a diverse array of models with mostly club and house music as the backdrop. The elements No Sesso played with in this collection were high, low, abstract, vintage and athleisure—and fittingly, what those elements look like when mashed up amid a mix of prints and fabrics. In short, it’s styling that’s purposely hard to label and lots of fun for the brave fashion killas among us looking for avant garde, nonbinary inspiration. Cheering loudly from the front row? Pose and Broadway star and NYFW Men’s Ambassador Billy Porter, who captured the energy of No Sesso’s Fashion Week debut for all of us.